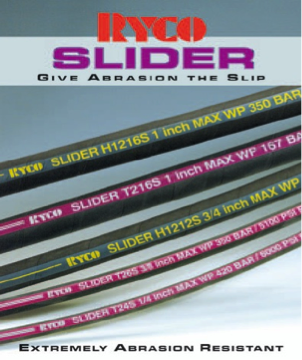 RYCO SLIDER is specifically designed for applications where abrasion resistance is paramount. It is available in T2S, H12S and H13S Hose Styles. RYCO SLIDER provides extreme abrasion resistance whilst maintaining a high degree of flexibility. ‘Give abrasion the slip!’ RYCO SLIDER saves additional cost and reduces assembly time by alleviating the need for additional abrasion protection such as RYCO SPIRAL GUARD in many applications. All RYCO SLIDER series meet MSHA Flame Resistant requirements.